Former Member of Phils and Reds Victim of Pneumonia at His Home in Philadelphia. PHILADELPHIA, March 13, Sherwood Magee, an umpire in the National League and a former major league outfielder, died at his home here tonight of pneumonia. Magee was 44 years old and for many years was a member of the Philadelphia Nationals. Later he was with Cincinnati. About a year ago, after he had quit the diamond, he was appointed to the National League umpire staff by President Heydler. Sherwood Magee, known in the baseball world as Sherry, was one of the most colorful players of his day. He was rated as one of the fleetest of the outfielders and among the best of the hitters during his big league career, which dated from 1904 to 1919. Magee was born in Claredon, Pa., on Aug. 6, 1884, and played his first professional game with Allentown, Pa. He was obtained by the Phillies in 1904 and remained with them for eleven years. He led the National League in batting in 1910, and in 1914 led the league in making two-base hits, collecting 39. In 1915 he was traded to the Boston Braves for Whitted and Dugey. He remained at Boston until August 1917, when he was traded to Cincinnati, and was a member of the Reds when Pat Moran led that team to its first National League pennant in 1919. In that year Magee was seriousely ill for two months. Magee later played with Milwaulkee, Minneapolis and Baltimore. 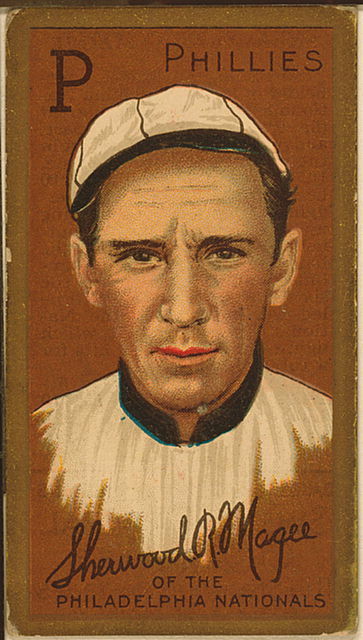 He umpired in the New York-Pennsylvania League in 1927. Please share your memories of Sherwood.